The Armani 5th Avenue store in New York City, designed by Massimiliano & Doriana Fuksas Architects, opened last week. The central feature of the 4-storey store is a sculptural steel staircase. Photos are courtesy of Fuksas Studio. On February 18, 2009 Giorgio Armani comes to the most celebrated street in New York. Fifth Avenue has been the focal point of many contemporary and historical events, and has featured in novels such as Edith Wharton’s The Age of Innocence, and countless films in which its most famous buildings such as the Empire State Building or the New York Public Library have played a major part. As for the museums, there are so many that the section that fronts Central Park is known as Museum Mile. “A really exciting challenge – that is how I would describe our new concept store, Armani/5th Avenue in New York. It is a special project requiring a degree of courage, as it brings together in one space different elements such as Armani Jeans and Emporio Armani side by side with Giorgio Armani. I was determined to send out a clear message of change, interpreting the current trend for mixing genres, juxtaposing items in different price brackets. You could say that this is a provocative move – uniting in the same place and with the same furnishings, without visible boundaries, the various collections that combine to form the entire Armani universe. On this avenue, that combines historical significance with an ultra modern, vibrant and pulsating buzz, at the intersection with 56th Street, Armani/5th Avenue is revealed as a neatly defined and light building completely clad in glass - 164 feet long and 45 feet high (50 meters long and 14 meters high). Spread over 4 floors, one of which is the basement, the store covers a total area of 43,000 square feet (4,000 square meters); the retail area covers approximately 30,000 square feet (2800 square meters) of which 5200 (480 square meters) is occupied by the Bar and Restaurant. Giorgio Armani has selected the architects Doriana and Massimiliano Fuksas and has actively collaborated with them throughout this building, conceived as a single, fluid space providing uninterrupted intercommunication, brought together by the impact of the vortex of the staircase. 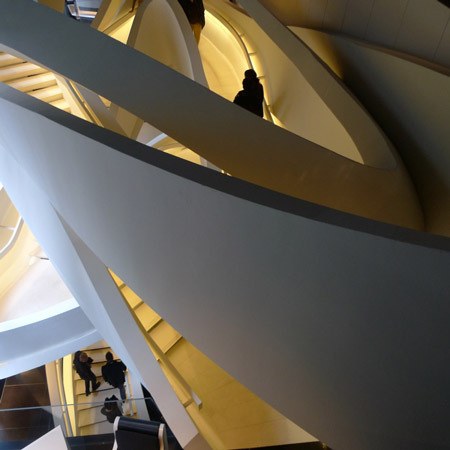 The heart of the building is, in fact, epitomized by the staircase, a structure in rolled calender steel, made in Italy, and clad in plastic material that highlights its exceptional sculptural presence, an entity that is almost impossible to convey in terms of any normal geometric shape. An interplay of slightly overlapping bands distinguishes the structure of the building and leads to the upper floors, gliding over the vertical surface of the interior. Each floor opens out into an ever-changing pattern of curved surfaces that add visual interest to the light putty-colored walls. Whereas the colors are pure and constant – beige for the walls, black for the floors and ceilings, and metal – the shine, the glossy look, the use of different materials, the reflections from the lighting - all suggest movement, subdued atmosphere and color. Special attention has been paid to the lighting, which defines and emphasizes the curvature of the walls and spaces. The use of curves is a constant feature throughout the interior design, and is evident in every aspect of the store, from the display units to the hanging units, from desks to armchairs. This fabulous concept store brings together the world of Armani throughout. For signature shopping, there is no better place to start than on the ground floor for Emporio Armani and Giorgio Armani accessories as well as the Emporio Armani collection for women. Down in the basement is the realm of those who favor a casual style of dress: Armani Jeans, EA7 – the sports line that includes specialized clothing and equipment, Emporio Armani Underwear and the Swimwear range. The further up the building, the more selective and refined the choice of products become. On the first floor, the Cosmetic area beckons, with its ultra sophisticated range of products with Crema Nera and the more sophisticated perfumes, followed by the area dedicated to Giorgio Armani and Emporio Armani shoes. From here it is a short hop to Giorgio Armani, Fashion, Classics and Eveningwear, all for women. Following the pathway of the staircase and descending a few steps, the space is dedicated exclusively to the fashion section of the Emporio Armani line for men. On the second floor, Emporio Armani, Giorgio Armani for men and Emporio Armani and Giorgio Armani shoes for men are displayed. This floor also houses Armani/Casa, offering a choice of objets; the space successfully evokes the huge Armani/Casa store in Soho. Nearby there is a small area dedicated to the delights of Armani/Dolci, the first retail area for this collection of delicacies to open in the USA. On both the first and second level, two specific spaces have been conceived and reserved for a private VIP fitting room. From the Armani/Restaurant on the top floor, a fabulous view can be enjoyed – through an amber-colored filter – down Fifth Avenue, with Central Park in the background. A line of lighting on the ground leads to the entrance to the restaurant, emphasizing the sensuous curve of the wall. A virtual curtain is raised as you pass through it… the show begins, making the customer the star. Doriana and Massimiliano Fuksas said: “The building that incorporates Armani/5th Avenue holds a very important place in the history of architecture because its façade is one of the first examples of the “International Style”. When one is dealing with such a cultural milestone, one must always bear in mind that the exterior is totally New York, while the interior should have its own identity. A reflection of the flair and aesthetic values that define the Giorgio Armani style. The Giorgio Armani collections will include a jacket in blue python skin, a crew neck cashmere pullover, jeans, eyewear with a metal tag, accessories in crocodile nappa, and watches. The Emporio Armani collections present an ultra urban and international look that reflects the vibrant energy so typical of Manhattan.